The FDA driver is close to the hat trick with his first double score in the championship. 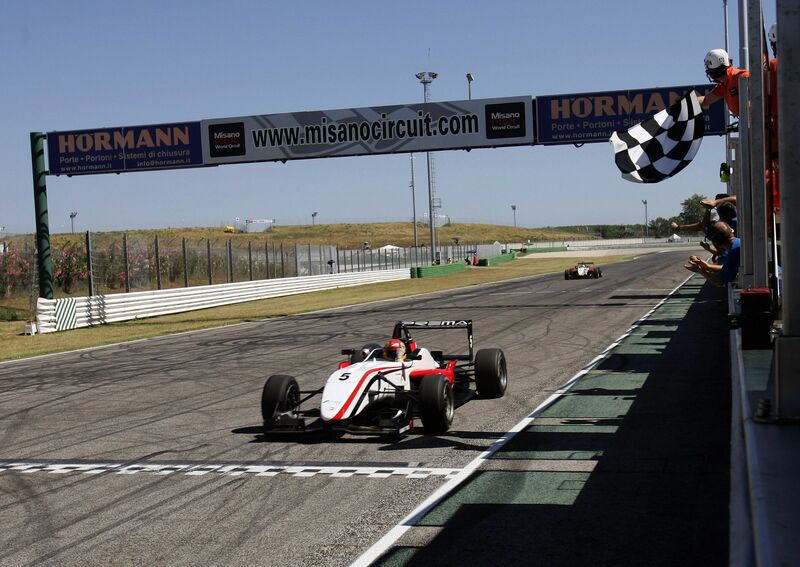 08/07/2012 - Two pole and two wins in the two most awarding points races are the Brandon Maisano’s score since now at Misano. In the second race the French took immediately the lead, followed by his team mate Eddie Cheever (Prema). Behind them Kevin Giovesi (Team Ghinzani) recovered from seventh to third in a hard fight with Riccardo Agostini (JD Motorsport), that finally overtook him during the sixth lap. The leading duo was anyway unreachable, and Agostini finished third with a 13 seconds gap from Maisano. Giovesi was fourth, followed by Sergey Sirotkin (Euronova). Then Maxime Jousse (BVM), Henrique Martins (Prema) and Nicholas Latifi (JD Motorsport), while Roman De Beer (Victoria), at his second race in Formula 3, closed ninth behind Yoshitaka Kurodoka (Euronova) and Mario Marasca (BVM), victim of a spin. Race 3 will take place this evening at 6.45 pm (GMT+2), broadcasted live in Italy on Rai Sport 2 and in live streaming on www.acisportitalia.it. Pole position for Kevin Giovesi (Ghinzani), that will share the front row with Maxime Jousse (BVM).